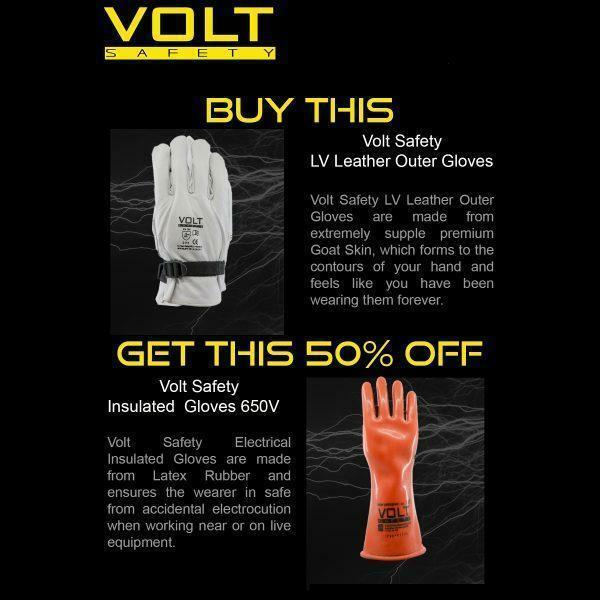 What a great offer…simply buy a pair of our famous Volt Safety Leather Outers and you can buy a pair of Volt Safety Electrical Insulated Gloves AS2225 650V at half price. 1. how many pairs you would like of each size? 2. do you have a preferred Electrical Wholesaler or Re-Seller? and we will arrange a quote for you. Volt Safety LV Leather Outer Gloves are made from extremely supple premium Goat Skin, which forms to the contours of your hand and feels like you have been wearing them forever.These gloves protect your hands and Electrical Insulated Rubber Gloves from any mechanical hazards and also from Arc Flash incidents up to CAT2 10cal/cm2. Kevlar stitching ensures they do not fall apart when the job gets sweaty and handy A strap with added velcro ensures the gloves fit just right with no extra mechanical hazard from the strap. All with the added advantage that Goat Skin does not get slimy and slippery when wet. Volt Safety Electrical Insulated Gloves are made from Latex Rubber and ensures the wearer in safe from accidental electrocution when working near on on live equipment. These Gloves are certified to the AS2225 manufacturing standard and they are also tested at our facility, prior to dispatch, to ensure they are ready to put into service on site when you receive them, complete with current test report. They have rolled cuffs to ensure they are easy to put on and do not pull apart under the strain. Our AS2225 range is available in sizes 9, 10 & 11. Our products are available through all good Electrical Wholesalers and Re-Sellers. Just contact us via the “ENQUIRE NOW” button and send us your details to take advantage of this awesome offer. – Offer valid until 31st December 2018 or while stock last. – There is no limit on quantity on this offer as long as the purchase quanity of Volt Safety LV Leather Outer Gloves is the same or greater than Volt Safety Electrical Insulated Rubber Gloves AS2225 650V. – Discount is based on RRP only, any bulk, trade or contract pricing in place can not be claimed on this offer. Great product and price. Shipping was very fast. Easy to deal with.